In the 1950’s, my parents opened an Italian restaurant in Lake Tahoe. They were truly pioneers of fine dining in that beautiful resort playground to the stars. Labor Day marked the end of their season–time now to hunker down for a snowy winter with months of refurbishing, repairing and getting the restaurant ready for the next summer. It was truly a Mom and Pop operation with Dad as the butcher and bartender. Momma was the gourmet chef, prepping all of the meals from scratch. My father was a butcher all of his life–one of the very first meat cutters at Safeway back in the 1930’s! Through the years I’ve talked a lot about my childhood and that I was the only kid in school who had prosciutto and mortadella hanging on hooks in the garage. I certainly I was the only kid whose parents bought parmesan cheese shipped from Italy in 80 pound wheels. My biggest “meal memory” growing up is how we gathered around our massive butcher block in the kitchen to eat meals, standing up, side by side, diving into slices of meats, cheeses, olives, pepperoncini and big slices of crusty Italian bread–the Chianti never too far from reach. 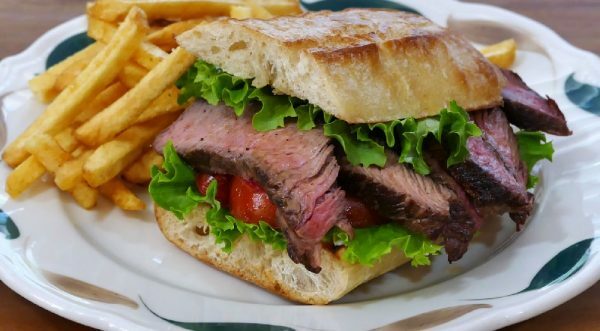 Steak sandwiches were a favorite. We’d pan fry a steak then slice it up and lay it open face on olive oil-brushed slice of bread with tomatoes from Momma’s garden that were also soaked in olive oil, salt and pepper. I’ve recreated our family sandwich for you including an incredible 2-ingredient cheese slather that brings the sandwich to life! I used a sirloin steak sliced thin, but you can use any cut of your favorite steak–or even better, one that’s on sale! Buon Appetito! Watch my how to video for this sandwich here. Drizzle steak with about 2 tablespoons of olive oil on both sides. Salt and pepper steak on both sides. Sear in a hot dry skillet or grill. Cook until medium, about 4-5 minutes on each side. Set aside to rest, about 10 minutes. When rested, slice in thin slices. In a bowl, add about 1/4 cup of olive oil. Add 1/2 teaspoon salt and pepper. Coat tomato slices in olive oil and set aside. Make gorgonzola slather. In a bowl, combine 1/2 cup sour cream or Alfredo sauce and 1/2 cup gorgonzola. Mix until lumps are gone. Grill bread. Spread cheese mixture evenly over 8 pieces of bread. For each sandwich, begin with lettuce leaf. Then layer tomatoes, steak, another lettuce leaf and finish with bread.